Off for half-term "looking after" the kids, some more than others. Long week of trips hither and thither has seen cafe visits to Sutton Hoo (Mon), Coffeelink (Tue), Caffe Nero (Wed) and Wimpy (Thu). Had planned an extended family light lunch before extended family cried off at the 12th hour. Change of plan required. Some 40 minutes later and the Broomobile (does that work?) is securely and cheaply parked atop a multistorey at Bury St Edmunds. 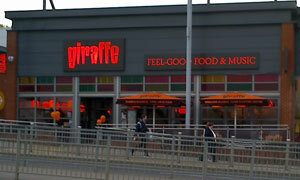 Down the many stairs, past KFC and Subway -- we can do better -- and into Giraffe. Been here once before with 2/3 of kids, much to disgust of remaining 1/3. They're a family friendly chain (hello, Pizza Express) originating from that London in the late 90s, and they must be doing something right 'cos they're spreading like a long-necked rash. Enthusiastically greeted and seated in a comfy booth at the back. Much perusing of menus: choices, choices. Buy some time by ordering milk shakes for those darn kids. Appetising options abound. Brunch item for me, the exotic sounding "huevos rancheros", which is what Slowpoke Rodriguez has for breakfast. Rest of 'em plump for burgers and chicken strips from the kids' menu, and we'll have some beer battered onion rings to share, thanks. Waitress returns with an impressive selection of branded sauces (HP, Heinz ketchup, mayo, salad cream, Tabasco, Encona hot pepper sauce, Sarson's vinegar and chili sauce). Yep, condiments of the house. Not long at all before the grub arrives, and we all pile in. Thumbs up for my tortilla with fried eggs, chorizo and salsa. Arriba! Apart from The Boy's bizarre claim that his fries are "too potato-ey", everyone is content and mightily stuffed. Yet we still want to see the dessert menu and we still find ourselves asking for a rocky road sundae. To share, naturally. Don't want to be greedy. Isn't cheap in here but makes a top half-term treat. If it was a car -- Toyota Landcruiser. If they were passing by -- Steve Backshall.